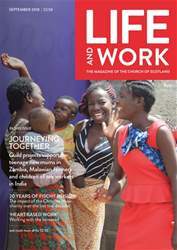 Digital Subscriptions > Life and Work > September 2018 > How free is your will? Jackie Macadam meets an academic who has studied the science of the mind. Among other topics, he studies conscious will and the ‘zombie challenge.’ The zombie challenge is the worry that our behaviour is produced by unconscious processes and our conscious mind does not cause behaviour at all. He says there are many famous empirical findings that have been interpreted as supporting that claim and the discussion whether or not the zombie challenge actually succeeds is still one of the hot topics in philosophy of cognitive science. “My family was agnostic in spite of our surroundings, but I was always interested in, and on the whole, sympathetic to, the work of the church”, he says.